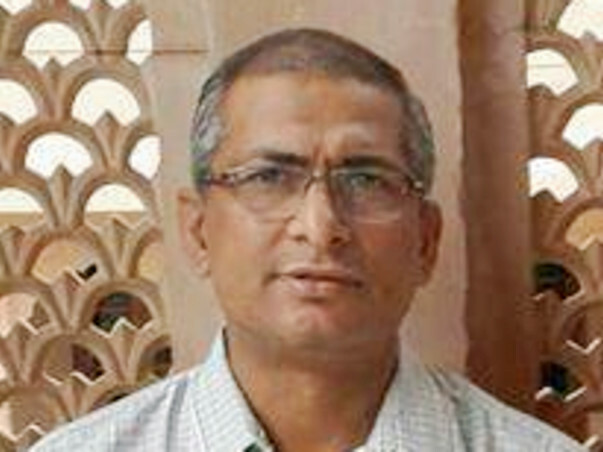 My Name is sanjay Kalia. I am suffering from Last stage CKD ( chronic Kidney disease ) for last four years .Currently both Kidney are not Functioning. Both are damaged 100%. 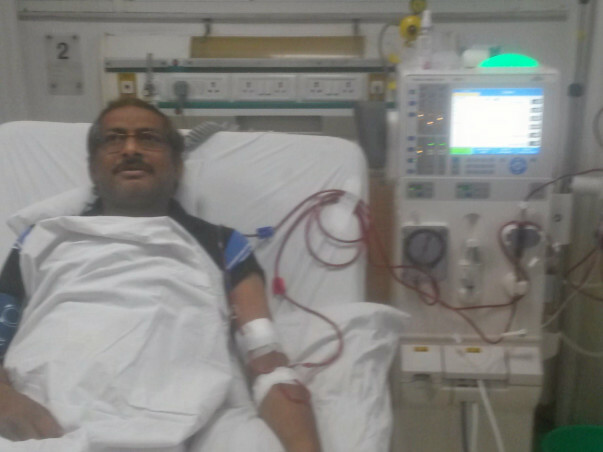 I am on Thrice a week Dialysis .Dialysis cost me Rs 2400 per Dialysis . Monthly Cost of Dialysis itself is Rs 30000 , beside this Injections and medicines cost around 26000 per month . we can say , cost of survival is Rs 56000 approx per month . 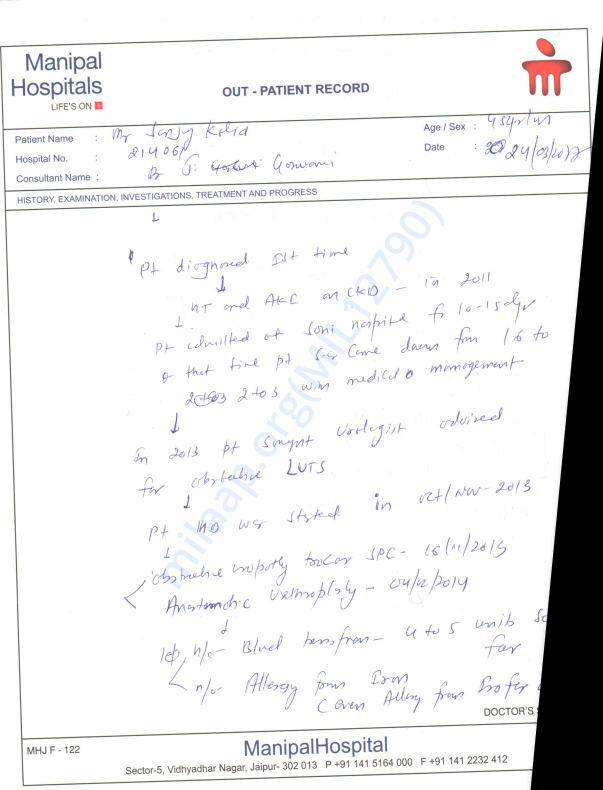 In Last four years I have spent around 27 lakhs in Dialysis, medicines , surgical procedures and consultations .Now a days I am experiencing other effects of CKD like anemia , hypertension etc . 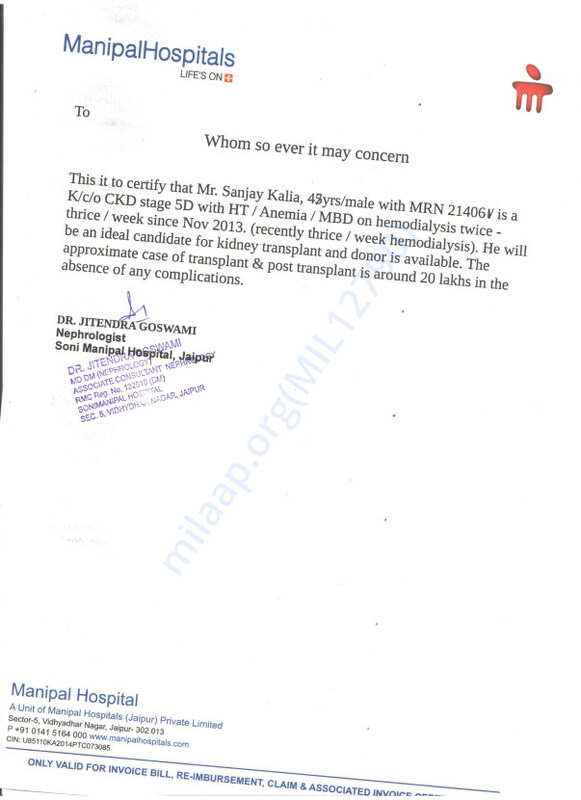 To protect my organs of body and side effects of kidney disease doctors are advised me to undergo Kidney Transplant . A kidney Transplant Costs approx 20 lakhs Rupees and needs for the rest of life followup cares and daily anti -rejection medications . the cost of post transplant medication can range from 20000 to 30000 per month . I have spent all savings in treatments in last four years and moreover as i have to spent three days in week in hospital my earning are touching ground level . First of all , I would like to thank you for your support and love. All your comments, blessings and love have been encouraging I had almost lost hope that I may Live long . As you know My kidney transplant was planned but due to Financially, Medically and with some other reasons, we had to postpone the transplant. We were not able to collect 50 % of the total required funds. During march-may you people had helped me Directly as well as through Milaap and we generated around 8 lakhs but the requirement was very high. Also we wasted 2-3 weeks as we unnecessary changed doctors and hospital. I am really thankful for my best friends Manoj Kr Singh and Lokesh Aggarwal who always stood with me in any cause good or bad since childhood .In this bad phase of my life, they come forward in spite of their busy schedule. They run the fundraising campaign through whatsapp and updated people about my health day by day.Both Contacted our old friends in India as well overseas. 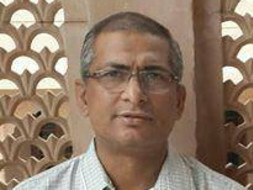 Nagesh Sisodia Who was my room mate in Pilani, and with whom I have no contact yet since Pilani days helped me with Rs 1,40,000. I am without earning fro last one year My all savings, deposits , insurances , bonds etc all are utilized in last four years. Moreover, I am in the hospital since 16th Sep- for almost 2.5 months .It may be easy to say or hear 2.5 month but I know I difficult it is when you have no money in pocket and in the hospital even for a water bottle you have to pay Rs 20. I am at my worst in financial condition. I SOUGHT YOUR HELP AGAIN TO LIVE further as in CKD without dialysis or medicines we can not live for even a small period. My kidney transplant was planned but due to Financially, Medically and with some other reasons, we had to postpone the transplant. We were not able to collect 50 % of the total required funds. Doctors have said that if it is not cleared there is no use of transplant They suggested me to visit New Delhi, Ganga ram hospital to get treatment of structure urethra which was also the main reason of Kidney damage. I started visiting Delhi for the treatment. Now I have to move back and forth between Manipal Hospital, MG hospital, and New Delhi. I have to return back for dialysis every alternate days. After 15 days Gangaram has done RGU. Now they have suggested surgery for urethral stricture which I have decided to get done at Manipal as I was still getting dialysis there. One day accidentally my left hand AV Fistula (used to do Dialysis) got damaged. Now, another project of my life started, first I have to get the temporary line fixed at neck for dialysis and getting new AV fistula on right hand. Fistula gets ready in minimum 21 days so it was necessary to keep neck temp line and we can not perform any other surgery or procedure till then. In mid of July, while going to Manipal hospital I fell sick, they put me on the ventilator, CPR was done, it was a Cardiac arrest. they kept me in ICU and gave me an invoice of 1,54000 for two days. when we have to pay This amount, we come to know that our balances are on very low sides . ( LOW means VERY LOW).After payment When Calculated balance was not even enough for one-month Dialysis. It was a very crucial stage for us because multiple treatments were running all along. Now, we have no other option to forget private hospital treatment. I get admitted to SMS government hospital. Whole year without work , I am broken now . Even not able to bear daily routine medical expenses. I request you to share this campaign so that I can have more funds to continue my treatment. My File got approved for transplant and Doctors have me 24th may, date of operation. I have to get admitted in the hospital on 20th of may. I have to deposit money that time. I am very thankful for all who have Supported me Financially but I am still very Far from my requirement. I am extending this Campaign for another 15 days.